Adobe is bringing all the RAW image editing capabilities of Lightroom 5 to the iPad. The photo software giant has released Lightroom Mobile for iPad. While the app is free, it's also only usable to those already enrolled as a Creative Cloud subscriber. Adobe's new iPad app links directly to the desktop version and pulls images from any synced collections marked from your computer. From the iPad, users will be able to adjust settings like Exposure, Contrast, Highlights, Clarity, Sharpening and all the usual tools seen on the full application. The best thing about the mobile app? Adobe has made it as iPad friendly as possible by using very little RAM. And the entire interface is touch friendly; swipes, finger taps and multitouch gestures do everything from adjusting saturation levels to peeking at the image before all your changes. Lightroom Mobile is powered entirely by Adobe's Smart Previews, which means users will have to be online all the time when using Lightroom Mobile. However, this also means the iPad won't have to be anywhere near your computer because it's using Adobe's cloud servers as an intermediary. Any changes that photo editors make on their iPad will be automatically applied to the original image the next time they start up the desktop version. What's more, wedding and other professional photographers will be able to carry around their portfolio without having to load it directly onto the iPad or upload it elsewhere online. While the Lightroom Mobile requires a Creative Cloud subscription, there's a great cheap way of getting into the "cool club" through the Photoshop Photography Program. For $9.99 (about £5.96,AU$10.67) per month, subscribers will get a copy of Lightroom 5, Photoshop CC, and any subsequent updates Adobe comes out with. 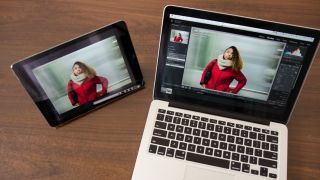 In addition to the iPad Air, Lightroom Mobile works on Apple's mini tablet, the iPad mini 2 with Retina display, and the iPad 2 and higher, as long as it has iOS 7 installed. What are the best tablets of 2014?